Does not slump in large tile and stone floor installations. Great for interior and exterior commercial and residential installations on walls and floors in both dry and wet areas (see product data sheet below for more limitations). 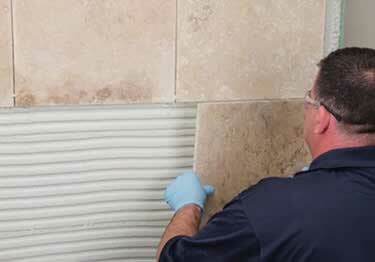 Protect tile installation from traffic for 24 hours and heavy traffic for 7 days. Protect from frost and rain for 7 days. MAPEI® Ultraflex™ LFT™ is a premium-grade, medium-bed and thin-set mortar that is polymer-enriched and designed for use with large format tiles. This non-sag tile mortar is ideal for use with large-format, heavy tile and stone in interior/exterior installations.